3 April, 2017 - "Google’s Android has overtaken Microsoft Windows for the first time as the world’s most popular operating system (OS) in terms of total internet usage across desktop, laptop, tablet and mobile combined. 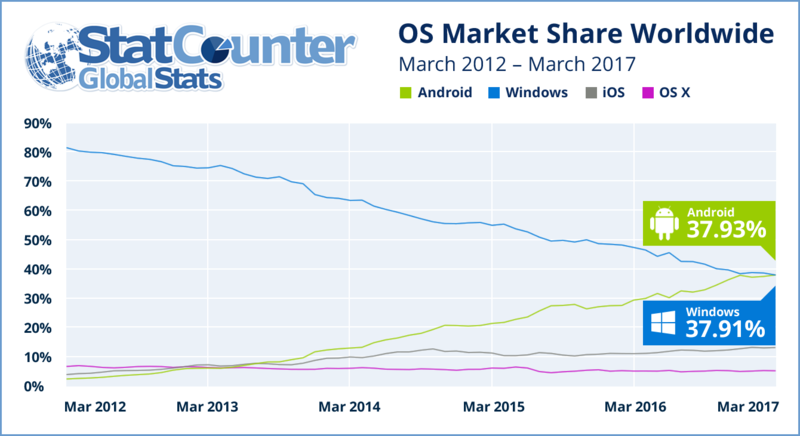 The research arm of StatCounter, the independent web analytics company, finds that in March, Android topped the worldwide OS internet usage market share with 37.93%, which puts it marginally ahead of Windows (37.91%) for the first time..."
Edited by AplusWebMaster, 05 April 2017 - 09:00 AM. Edited by AplusWebMaster, 02 May 2017 - 09:57 AM.